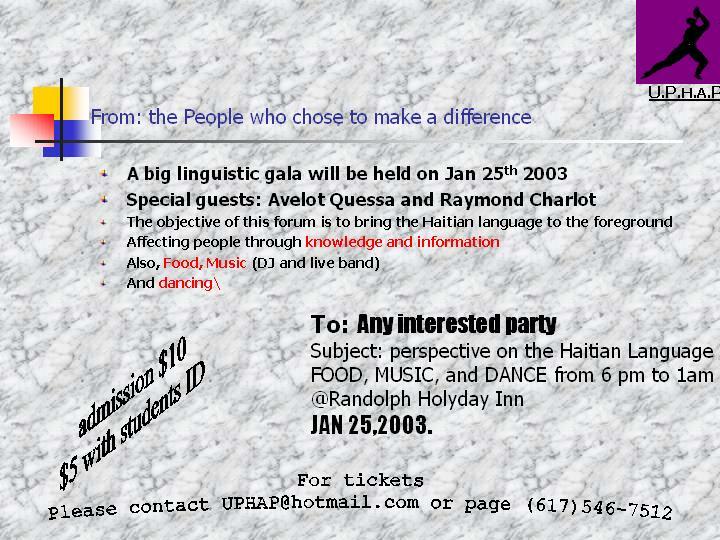 The Haiti Democracy Project -- Invitation to the February 22, 2003 Event in Silver Spring, Maryland: First of its "Bridges to the Policy-makers" series designed to afford the Haitian-American community a voice in the policy debate. * Mr. Michel Soukar (Haitian historian, journalist, & lecturer) Lecture on "Haiti: Aujourd'hui et demain? ", "Haiti: Today and what of tomorrow? ", & signing of his books: Radiographie de la Bourgeoisie Haitienne; Classe Sociale et Processus démocratique en Haiti. First of our "Bridges to the Policy-makers" series designed to afford the Haitian-American community a voice in the policy debate. We urge all who yearn for a better future for Haiti to attend this important event. The Haitian communitys voice and views should be heard! MICHEL SOUKAR Biographical Data Poet, playwright, author, historian, journalist, and lecturer, born in Port-au-Prince in 1955, Michel Soukar has since 1974 spoken out in defense of public liberties and for the establishment of democratic processes in Haiti. Consequently, Michel Soukar was exiled under the Duvalier regime from 1984 to 1986. He is the co-founder of Collège de Port-au-Prince, the "Democratic Movement Congress (CONACOM), and Secretary-General of the Association of Haitian Writers. He has been invited by the governments of Germany to witness the reunification of the Two Germanies, to France to give a conference à la maison de lAmérique Latine, and to Venezuela in 1990 to meet with President Carlos Andres Perez, whom he subsequently interviewed in 1991. He is the recipient of the year 2000 prize "Work and Justice," awarded by the "Centre mondial d'aide à l'enfance et à la jeunesse," presided over by Mrs. Betty Williams, the winner of the Nobel Peace Prize and co- founder of the Northern Ireland Peace Movement. Mrs. Williams has stated that Michel Soukar is today one of Haiti's voices that is the most heeded and respected. Since 1993, he has served as a radio personality/animator of educational programs on Haitian history, economy, and international politics. He is the author of "Entretiens avec l'Histoire: Haïti de Duvalier à Lavalas" and "Radiographie de la Bourgeoisie haïtienne." Additional biodata on the other presenters will be forthcoming. Please check the website for more details. Professor Allyn Bradford, currently teaching at Wentworth Institute of Technology and UMASS Boston, has extensive experience in team development. He has conducted trainings for organizations such as the American Management Association, Stop & Shop, Honeywell, New England Nuclear and Burger King. Reservations are required due to limited seating. Visit our web site at www.towncomputer.com to register! Town Computer is Boston's most convenient technology service provider, and has been ranked among the area's 25 top computer dealers by the Boston Business Journal two years in a row, 2002-2003.